We have an in-house lab so most tests can be done and have results within minutes. Having these machines helps getting the diagnosis and treatment plan sooner for your pet. Our bloodwork panels include a cbc, chemistry and electrolytes. 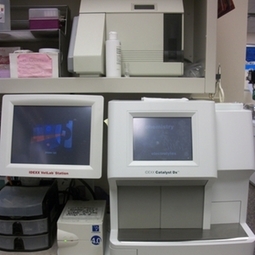 We can also run urinalysis, cytologies, parasite testing and many more tests. We also utilize an outside lab for biopsy results and specialized testing.